The Seleucid Dynasty had come under the authority of Antiochus IV, whose reign began in 175 BCE. He ruled from Syria, and his empire included Jerusalem, and he assumed that the worship of Yahweh among the Jews could be transformed as easily as had occurred in his dominions farther east – where Jews worshiped Yahweh under the name of Zeus Sabazions. He assumed that the Jews of Judea would easily accept the notion that all worshiped the same God. In 167 he had the temple in Jerusalem rededicated as a shrine to Zeus, and some Jews saw Antiochus as compelling them to practice idolatry – something neither the Persians nor the Ptolemies had tried to force upon them. Rather than allow time for Jews to start using Greek as the name for their god, a military expedition was sent around Judea to force compliance with the new laws of worship. The expedition came upon an old priest in the village of Modein who refused to offer a sacrifice to Zeus. The priest, Mattathias, struck down another Jew who was about to do so. To escape punishment, Mattathias and his five sons – the Maccabees family – went with other Jews into the Gophna Hills. Their rebellion won support from people throughout Judea. It was supported too by the author of the Book of Daniel – which was written during the time of the war that was unfolding – to be known as the Maccabaean war. 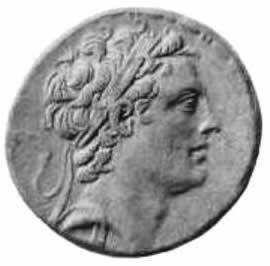 Antiochus IV. He believed Jews would recognize a universal god named Zeus. The rebellion became partly a civil war and partly a war of national liberation. Its opposition to the rule of Antiochus IV pleased the great power on the Italian peninsula, Rome. Rome wished to see Antiochus IV weakened. And to strengthen his forces against Antiochus, Judas Maccabeus made a treaty with Rome. The Maccabaean rebellion took control of much of Judea, but Judas Maccabeus was not from the appropriate aristocratic family that qualified to the highest position among the Jews: the High Priest. That position went to a priest named Alcium. He supported the rebellion, but some among those fighting for independence objected to the appointment, believing that Alcium was insufficiently devout and insufficiently hostile to foreigners and foreign influences. Alcium responded with force: he had sixty of these critics executed. In 141 BCE, more than twenty-five years into the rebellion the rebels managed to expel the Seleucid dynasty's garrison from the citadel in Jerusalem. With the strength of Rome behind the Maccabees, Judea won formal independence: an independent Jewish state for the first time in more than four centuries. By then Judas Maccabeus and other Maccabees had died, and the last of the five Maccabeus brothers, Simon, ruled. Simon Maccabeus was chosen by the popular assembly as High Priest despite his lack of qualifications by birth. He also took the position of "ethnarch," or Ruler of the Nation, announcing that his family would rule only until a true prophet should arise. He created a festival called Hanukkah to celebrate both Judea's independence and the day that his rule began.